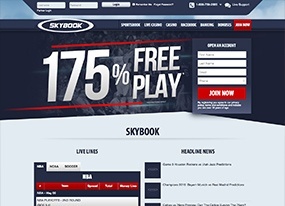 The Skybook.ag online sportsbook turns 21 this year, and to celebrate, the site is welcoming new bettors aboard with two generous Welcome Bonus offers. Just enter the bonus code “175BONUS” to earn a 150 percent free-play match when you fund your Skybook account with between $300 and $1,500. You can also use the bonus code “P2P” on deposits between $300 and $1,000 to score a 100 percent cash match. Based in Costa Rica, Skybook focuses on the U.S. market primarily, so American players are welcome to sign up and enjoy this world-class sports betting service. And a license issued by the Curacao eGaming Authority provides valuable peace of mind, as every line posted and wager placed is strictly supervised by industry-leading regulators. Throw in a streamlined software suite, intuitive interface, and a sprawling menu of sports and leagues, and Skybook is the next best thing to visiting Las Vegas’ betting scene. As an American-facing platform, Skybook’s sportsbook selection is geared toward the country’s “Big Four” professional leagues - NFL, MLB, NBA, and NHL. The betting market menu on the left side of the landing page displays sports according to timeliness, so whatever leagues are in season show up first on the list. Playoffs are given priority too, with postseason basketball found ahead of regular season baseball. Under the most relevant markets are several niche sports, beginning with nearly a dozen different soccer markets. Major League Soccer (MLS), English Premier League (EPL), UEFA Champions League, and of course, the FIFA World Cup are all available. Other minor sports include golf, tennis, boxing, MMA, motorsports, cricket, rugby, and darts – just to name a few. Odds are listed in the American moneyline format (+110 v. -110, etc. ), and you can bet straight, point spreads, game totals, parlays, teasers, round robins, if wagers, and props. And don’t forget about Skybook’s astounding Free Half Point promotion, the perfect way to gain a leg up on any football or basketball point spread bet. You’ll get a 0.5 point in your favor, all without paying a penny more in vig. Staying connected to the sports world is essential for serious bettors. Breaking news and corresponding line movements can combine to affect your bottom line, which is why mobile access to your online sportsbook is a must. Thankfully, Skybook goes above and beyond when it comes to the site’s mobile presence. Devices using the Apple iOS (iPad, iPod Touch) or Android operating system can connect directly to your Skybook account via web browser. Simply pull up Google Chrome, Safari, or your preferred web browser and head to the Skybook site like you would on a desktop or laptop. Mobile access extends to other devices - including the Blackberry Torck, Palm WebOS Pre, Pixia, and Nokia N900 - a nice touch considering most competitors stick to iOS and Android. Like any online sportsbook worth its salt, Skybook keeps you connected to the action long after tipoff or the first pitch. Head to the Live Betting menu to find a running selection of the day’s ongoing games and matches. It doesn’t matter if the scoreboard shows a blowout or a nail-biter, Live Betting on Skybook provides continually updated point spreads and moneylines to reflect current game conditions. Maybe a favorite’s feared star suffers an early injury, or weather conditions level the playing field. The coach might bench a cold hand in favor of a sixth man sleeper. Trigger happy umps can toss your team’s best batter. Whatever happens on the field, Live Betting offers an immediate opportunity to capitalize with a well-timed wager.